Craftsmanship is in the DetailsTake a look! Our Tablet Enclosures are engineered to be one of the best asthetics enclosure in the market today. With attention to details like a speaker , interior pads for tablet protection, and a power button service knockout, each enclosure is precision made from high strength Mild steel for uncompromising rigidity and long lasting beauty. We like to think of it as a work of art. Don't see your tablet model? contact usand let us know what you need. The Samsung Galaxy Tab1 & Tab2 Enclosure and Samsung Galaxy Note 10.1 Enclosure secure wall mount is the ideal Galaxy Tab security solution for all display settings including education, health-care, corporate, retail, KIOSK and point of sale environments. Our Galaxy Tab1/2 Enclosure and Galaxy Note 10.1 Wall Mount is closed on all sides to provide a tamper-proof security solution. The charging cable is secured within the enclosure with an opening for the wire to allow for mounted charging. The Samsung Kiosk Enclosure is secured and is great for mounting on the wall, over the table and more. • Protects your Samsung Tablet - stolen or damaged when placed on public areas. 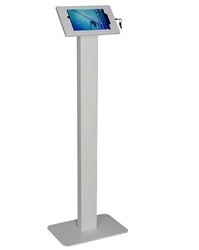 • WinBook TW800/801/802 8", & TW100 10"
Looking for Floor mount touchscreen tablet Stands ?